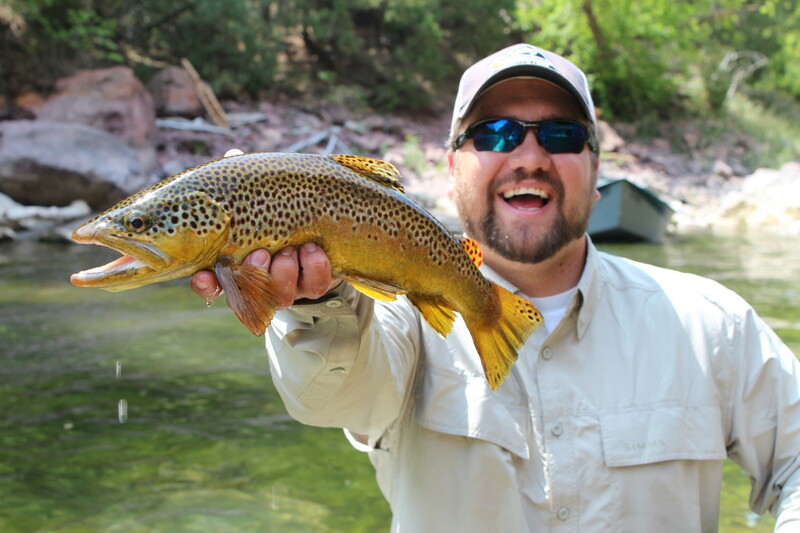 The Green River below Flaming Gorge Reservoir is one of the west’s premiere fly fishing destinations. If you haven’t fly fished this incredible fishery, this article is here to provide you with all the essential information you need for this bucket-list fishing trip. 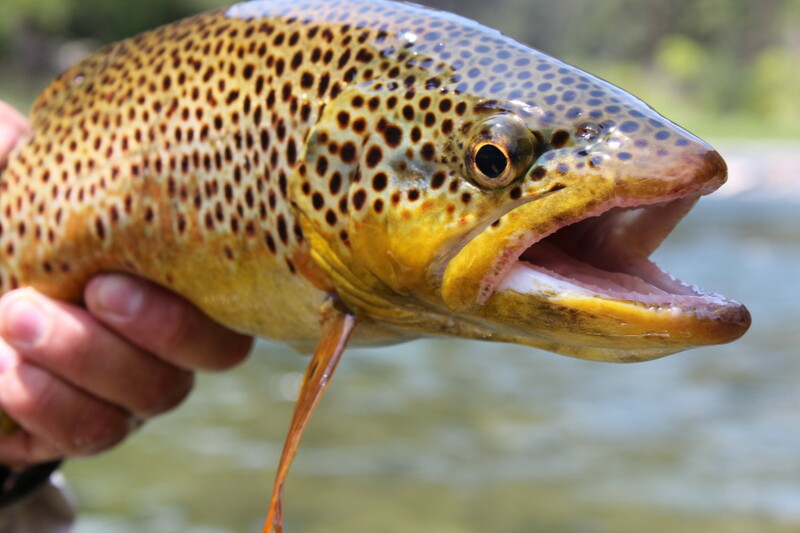 When fly fishing the Green River, you have over 30 miles of float fishing in crystal clear water give the experienced oarsmen chances to catch brown, rainbow, cutthroat, and brook trout. Most fish average between 14-18 inches with fish over 20 inches being more and more common these days. Unique chances to fish size 2 / 4 Cicada patterns and stare at fish in pools 30ft deep give the Green it’s well deserved fame. The river is broken down into 3 separate sections by the US Forest Service for management purposes. Section A “Red Canyon” From the Dam to Little Hole. Section B “Devils Hole” from Little Hole downstream to Indian Crossing. Section C “Browns Park” Is from Indian Crossing to State bridge. This section from Little Hole down stream to Indian Crossing is 9 miles long. Walk wade access is blocked by a ridge about 1/2 mile from the boat launch. If your ready for a hike there’s a foot trail over the ridge but.. again floating is your best bet. With limited access and the average shuttle fee about $100 fishing pressure is dramatically reduced. For the inexperienced oarsman I highly recommend you take a guide trip your 1st run down due to Red Creek Rapids. This class III rapid is well marked and can be scouted from river right, and really should be no problem for the experienced oarsman. Just stay river left!! Being farther from the Dam you will find fewer fish than in A Section but the average size increases to 18-20 inches, with some fish being 22″ and Bigger. Dry dropper is my rig of choice when fishing B section and some would argue this to be the best dry dropper water in the country. This section totals over 15 miles long and is set apart from the upper two sections. It is the easiest section to row and should not be a concern for even an inexperienced oarsman. Flowing though Little Swallow Canyon and Swallow Canyon these areas offer fantastic fishing along with beautiful views. The rest of C Section goes through Browns Park that has the characteristics of sage brush desert. 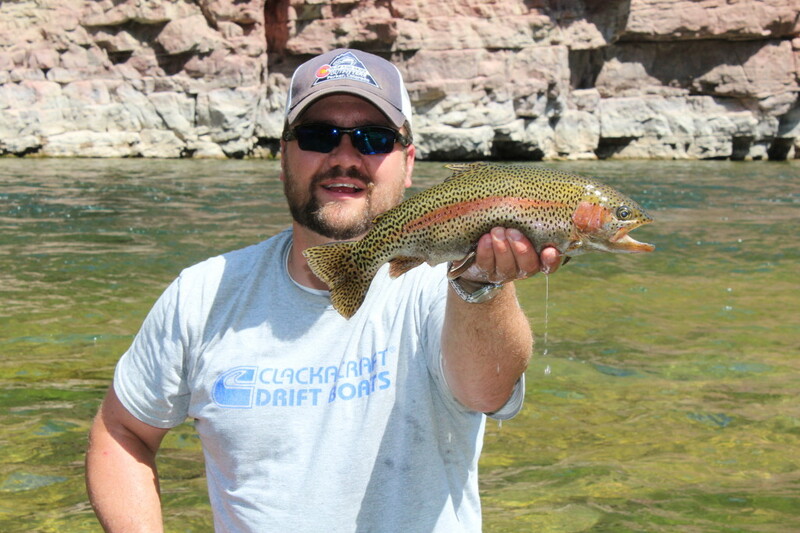 Nonetheless Browns Park offers up double digit lb Rainbow and Brown trout every year. Though your numbers of fish will be lower chances at monster trout on the Dry keep me coming back year after year. Midge Hatch: A 365 day a year bug! don’t leave home with out a good selection. BWO Hatch: Spring Blue wing olive mayflies are going to be your 1st hatch to really bring up every fish in the river. From late February to early May these size 16-18 bugs are like trout candy. Pale Morning Dun: Good numbers appear in March and last through May on warmer days. A technical dry to present properly but can reward persistent anglers with good fish. Cicada Hatch: Typical to see/hear the Cicada Hatch just after high water. Bigger bugs equal bigger flies and some epic takes. Year to year Cicada’s very on how heavy the hatch can be based on weather and the Cicada’s life cycle. Yellow Sally Stone Hatch: Following the Cicada’s is the yellow sally, it is typical to see this Hatch in good numbers after the 4th of July. Pounding the bank and throwing these drys in fast runs is an effective tactic. Caddis Hatch: This hatch can be the most prolific bug activity on the river all year. lasting from June to September this is one of my go to bugs to bring fish to the surface. Terrestrials: When I think of the green river I see big foam hopper patterns, Beatles, and Ants. Weather its a dry dropper rig or double drys, terrestrials offer a some of the best fishing the Green can offer up.